Certain foods can trigger symptoms, such as nuts and dairy. Symptoms vary according to the age of the person with eczema, but they often include scaly, itchy patches of skin. Eczema can also be triggered by environmental factors like smoke and pollen. However, eczema is not a curable condition. Treatment focuses on healing damaged skin and alleviating symptoms. There is not yet a full cure for eczema, but symptoms can be managed. Eczema is not a contagious condition. The symptoms of atopic dermatitis can vary, depending on the age of the person with the condition. Atopic dermatitis commonly occurs in infants, with dry and scaly patches appearing on the skin. These patches are often intensely itchy. Most people develop atopic dermatitis before the age of 5 years. Half of those who develop the condition in childhood continue to have symptoms as an adult. However, these symptoms are often different to those experienced by children. People with the condition will often experience periods of time where their symptoms flare up or worsen, followed by periods of time where their symptoms will improve or clear up. Rashes commonly appear on the scalp and cheeks. Rashes usually bubble up before leaking fluid. Rashes can cause extreme itchiness. This may interfere with sleeping. Continuous rubbing and scratching can lead to skin infections. Rashes commonly appear behind the creases of elbows or knees. They are also common on the neck, wrists, ankles, and the crease between buttock and legs. Rashes can lighten or darken in color. Rashes can thicken in a process known as lichenification. The rashes can then develop knots and a permanent itch. Rashes commonly appear in creases of the elbows or knees or the nape of the neck. Rashes cover much of the body. Rashes can be especially prominent on the neck, face, and around the eyes. Rashes can cause very dry skin. Rashes can be permanently itchy. Rashes in adults can be more scaly than those occurring in children. Adults who developed atopic dermatitis as a child but no longer experience the condition may still have dry or easily-irritated skin, hand eczema, and eye problems. The appearance of skin affected by atopic dermatitis will depend on how much a person scratches and whether the skin is infected. Scratching and rubbing further irritate the skin, increase inflammation, and make itchiness worse. The specific cause of eczema remains unknown, but it is believed to develop due to a combination of genetic and environmental factors. Children are more likely to develop eczema if a parent has had the condition or another atopic disease. If both parents have an atopic disease, the risk is even greater. Irritants: These include soaps, detergents, shampoos, disinfectants, juices from fresh fruits, meats, or vegetables. Allergens: Dust mites, pets, pollens, mold, and dandruff can lead to eczema. Microbes: These include bacteria such as Staphylococcus aureus, viruses, and certain fungi. Hot and cold temperatures: Very hot or cold weather, high and low humidity, and perspiration from exercise can bring out eczema. Foods: Dairy products, eggs, nuts and seeds, soy products, and wheat can cause eczema flare-ups. Stress: This is not a direct cause of eczema but can make symptoms worse. Hormones: Women can experience increased eczema symptoms at times when their hormone levels are changing, for example during pregnancy and at certain points in the menstrual cycle. Management a general approach to the management of eczema includes advice, education and support, required for patients with eczema of any type. Intensive and prolonged treatments are often required and chronic eczema can have a major and devastating adverse impact on personal and family lives. Emollients and topical glucocorticoids are mainstays of treatment for all eczema types, in order to improve skin barrier function, limit transepidermal water loss and reduce inflammation. Emollients can be used as bath additives and soap substitutes, and applied directly to the skin, often combined with antiseptics. Sedative antihistamines are useful if sleep is interrupted but non-sedating antihistamines are ineffective, as the itch of eczema is not primarily mediated by histamine. Ointments are preferred for chronic eczema, whereas cream- or lotion-based treatment may be more appropriate for acute eczema. Treatment is once to twice daily. Hydrocortisone (1%) or clobetasone butyrate is generally used on the face, with more potent glucocorticoids restricted to trunk and limbs. A good strategy is to employ an intensive regimen with more potent glucocorticoids initially and then taper use according to response. A key principle is to use the least potent glucocorticoid that is effective for the shortest possible time. The patient should be given instructions on how much to apply, using the fingertip unit for guidance (a strip of glucocorticoid cream on distal phalanx pulp should cover two palm-size areas). It is also important to monitor glucocorticoid use and the easiest way to do this is ask how long it takes to use a specific size of glucocorticoid tube. The side-effects of topical glucocorticoid therapy need to be considered but glucocorticoid phobia and under-treatment of eczema are often more of a problem than over-treatment. Particular care should be taken on certain sites, such as the face and flexures, and in children and the elderly. The clinical features of eczema influence the choice of topical treatment. 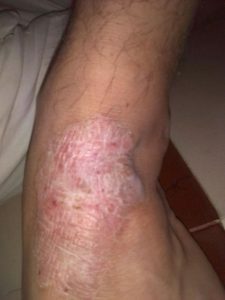 For example, appropriate treatment of acute exudative eczema could be with potassium permanganate soaks, emollients and topical glucocorticoids under wet wraps. Chronic eczema may be best treated with a potent topical glucocorticoid in an ointment formulation and occlusion with a paste bandage to ease itching and scratching. The topical calcineurin inhibitors tacrolimus and pimecrolimus may be useful glucocorticoid-sparing agents for eczema, particularly on the face; they cause local cutaneous immunosuppression. Initial burning and stinging may limit use but are usually transient side-effects. Bacterial and viral skin infection risk may be increased due to immunosuppression. Caution should be employed with sun exposure and these agents should not be used in combination with phototherapy because of their immunosuppressive effects. There is no cure for eczema. Treatment for the condition aims to heal the affected skin and prevent flare-ups of symptoms. Doctors will suggest a plan of treatment based on an individual’s age, symptoms, and current state of health. For some people, eczema goes away over time. For others, it remains a lifelong condition. Topical corticosteroid creams and ointments: These are a type of anti-inflammatory medication and should relieve the main symptoms of eczema, such as skin inflammation and itchiness. They are applied directly to the skin. If you want to buy topical corticosteroid creams and ointments, then there is an excellent selection online with thousands of customer reviews. Systemic corticosteroids: If topical treatments are not effective, systemic corticosteroids can be prescribed. These are either injected or taken by mouth, and they are only used for short periods of time. Antibiotics: These are prescribed if eczema occurs alongside a bacterial skin infection. Antiviral and antifungal medications: These can treat fungal and viral infections that occur. Antihistamines: These reduce the risk of nighttime scratching as they can cause drowsiness. Topical calcineurin inhibitors: This is a type of drug that suppresses the activities of the immune system. It decreases inflammation and helps prevent flare-ups. Barrier repair moisturizers: These reduce water loss and work to repair the skin. Phototherapy: This involves exposure to ultraviolet A or B waves, alone or combined. The skin will be monitored carefully. This method is normally used to treat moderate dermatitis. Even though the condition itself is not yet curable, there should be a particular treatment plan to suit each person with different symptoms. Even after an area of skin has healed, it is important to keep looking after it, as it may easily become irritated again. 2. Itching persists more than 24 hours. 3. Its hazard your daily life.